The western gray squirrel, Griffith Park’s only indigenous tree squirrel species, is losing traction across the west coast states. The competing eastern fox squirrel accidentally introduced in California in 1904 may be one factor leading to noticeable declines in the presence of the western gray. Habitat loss and urban development also play a role in this squirrel’s decline. CSULA biology grad student Chris DeMarco is looking at western grey squirrel genetic material in order to learn more about this species. The genetic diversity of the Griffith Park squirrel population will be compared to that of populations in the Santa Monica Mountains to the west of the park and then the gene flow between these populations will be assessed. Gene flow and genetic diversity are important issues in the fragmented habitats of our urban area. Long-term viability of squirrels, bobcats and mountain lions is questionable due to the lack of connections across freeways. In Griffith Park, crossing opportunities on Hollywood Freeway through Cahuenga Pass on overpass bridges continue to provide a critical connection to the large habitat areas of the Santa Monica Mountains to the west. 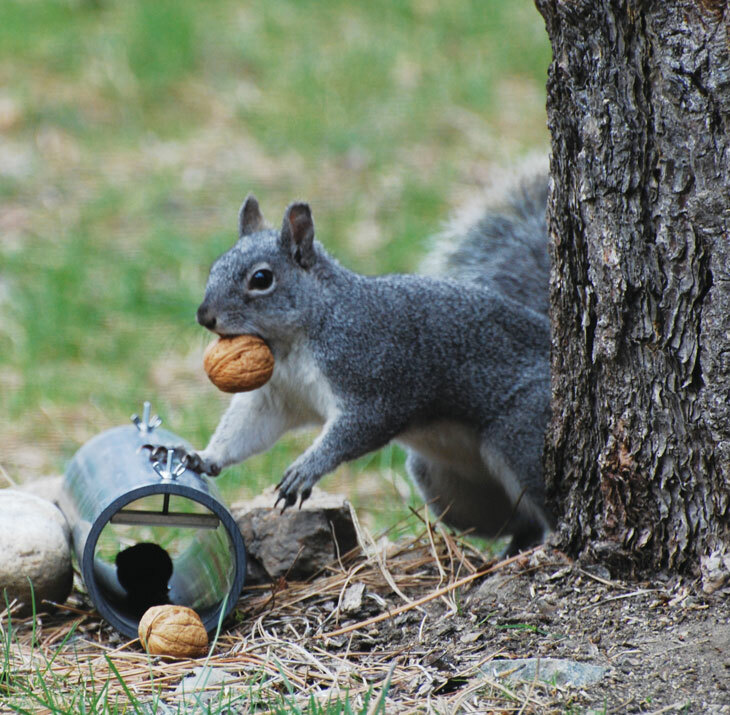 Results from this study will give scientists insights about conservation measures in order to enhance healthy populations of the western grey squirrel. Also, a prediction of the longevity of the Griffith Park squirrels or their population extinction will be made based upon genetic findings. The ubiquitous western gray squirrel in Griffith Park is nothing to take for granted. These squirrels are a gorgeous species with pure white bellies and large fluffy gray tails. Friends of Griffith Park has fully funded the costs of the study through a grant to CSULA because we recognize the importance of this species within Griffith Park. The study is now launching. Hair tubes are being deployed in various areas within Griffith Park. These harmless non-invasive contraptions will snare hair from squirrels which will then be collected and analyzed. The hair roots provide DNA material that will identify genetic profiles of various pockets of western grey squirrels within the park. If you see these hair tubes, please leave them alone and spread the word to others. Fern Dell, Oak Canyon, and Vermont Canyon are just a few of the areas where these devices will be placed. For additional information, please contact us via our website.